What next? A new appliqué project? I’ve so many different things to post about and I can’t decide where to start. There’s the fabric orders that arrived from Hancock’s and Shabby Fabrics; the new knitting I’ve started, the gorgeous new fine yarn I bought and the lacy shawl patterns I’m agonising over; then there’s my latest applique project and the new way I’ve tried for transferring the pattern and… Well you get the picture. I love the pattern on this copper tray table and I thought it would make a great reverse appliqué project but I couldn’t think of a good way to transfer the pattern. Using tracing paper like I usually do would be difficult even if I stuck it down because of the slippery rounded metal edges. Then I remembered that my friend Annette from the QuiltsByHand Yahoo group once sent me some Press ‘n’ Seal. So I decided to give it a go. It is wonderful! I used three strips of it to cover the tray and it stuck beautifully. 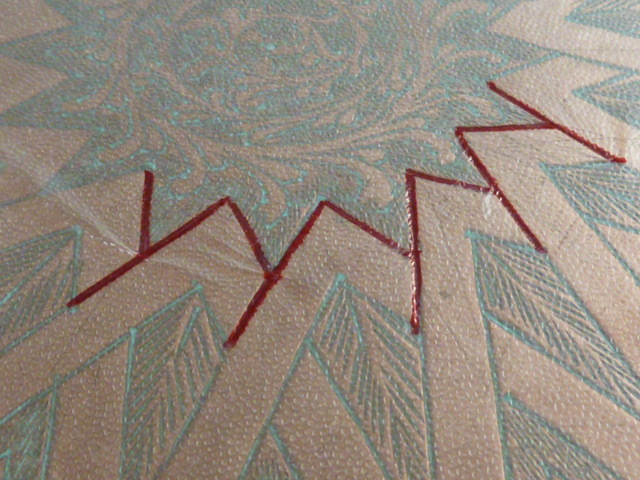 I used a red Sharpie pen and drew the design onto the Press ‘n’ Seal and, as you can see, that also worked well. Once I had transferred the design, I taped the three strips of Press ‘n’ Seal together so i could remove it in one go. I brought my light box next to the tray so I could quickly transfer it to a flat surface. I removed it carefully from the tray doing my best not to stretch it. Once on the light box my plan was to put the fabric I had chosen for the background (a grey Kona solid) over the lightbox and trace the design onto it in pencil. I tried this but the fabric moved too much. 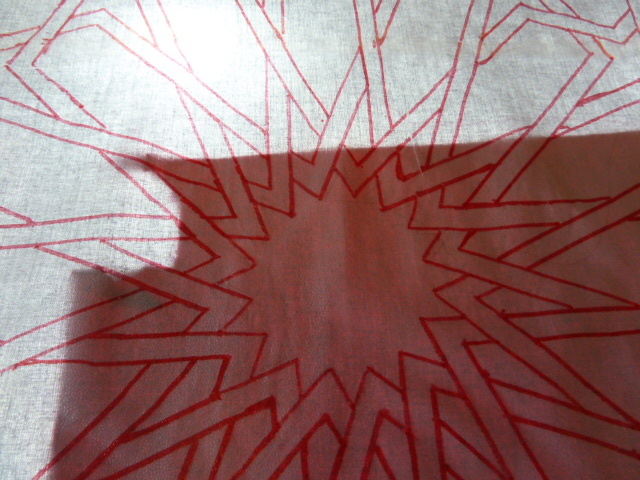 This isn’t much of a problem with leaves and flowers but with straight lines and geometric patterns it is. Then I had a vague memory from an online appliqué class about being able to stick the Press ‘n’ Seal directly onto the fabric so that’s what I did. 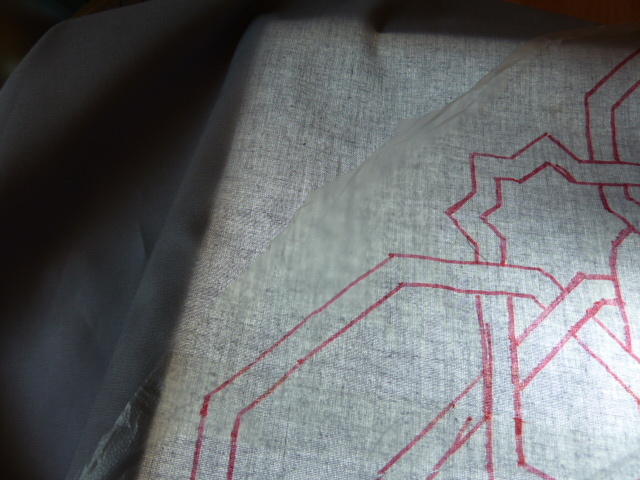 I laid my fabric flat and very carefully pressed the Press ‘n’ Seal onto it and it stuck really, really well. I’ll show you more of the process of attaching the other fabrics and basting them into position in my next post, so stay tuned. I have a book of Islamic designs which includes this one and I’ve been experimenting with the different ways to do the designs in appliqué for years. As you said the geometry makes it pretty difficult and 1mm on one piece can expand to knock the whole thing out of kilter. Good luck as it’s a beautiful pattern and I look forward to seeing your results. 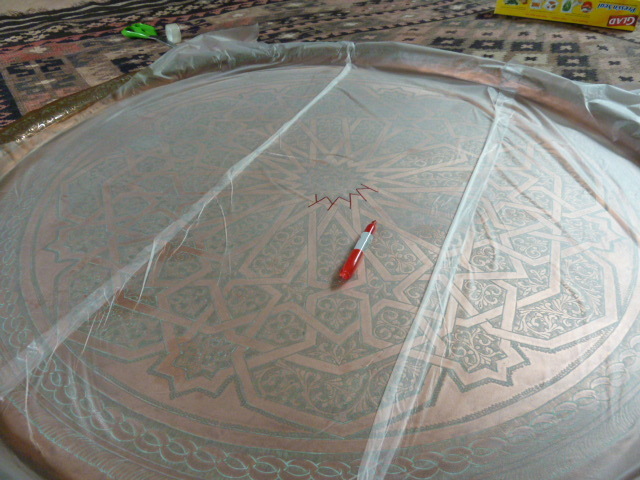 I have many books of Islamic patterns too but as this one was already “drawn to size” so to speak I thought it was easier than drawing my own. I just hope it works. 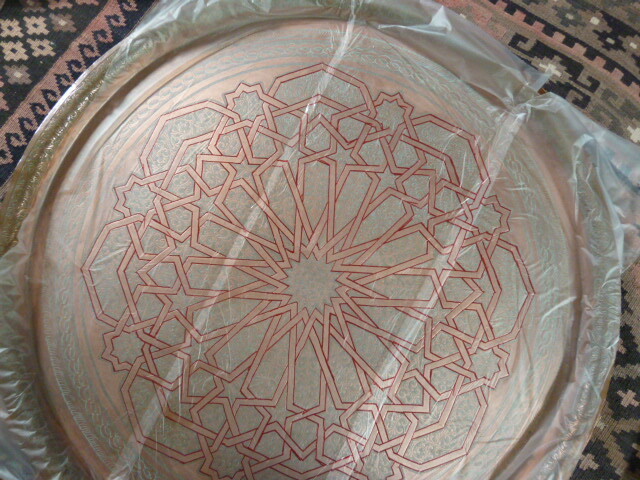 I love this type of Islamic design. The geometry of it fascinates me. I’ll be watching your progress with great interest. I look forward to seeing yours Barb. 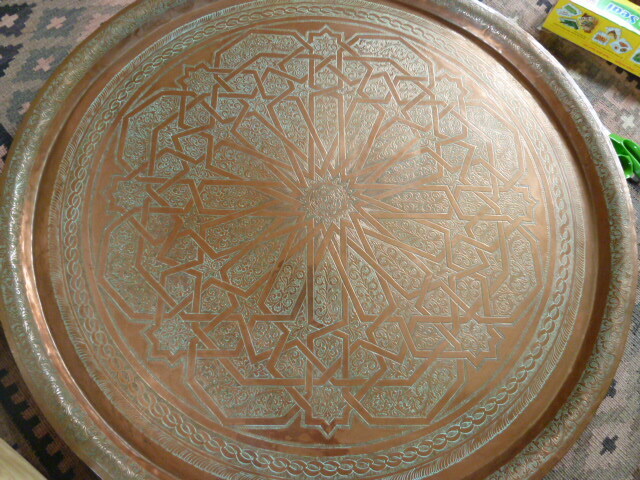 Will you use batiks. Thank you soooo much for that tutorial with photos! 🙂 I’ve always heard of using press n seal, but never have. Looks like it will have a new place in my sewing room beside the fP. 🙂 AND, if I look at that table design, you’ve already got a good example of how to quilt it. WOW! Great problem solving! I must keep in mind about the press and seal. The pattern looks very challenging, I’ll be looking forward to seeing more.